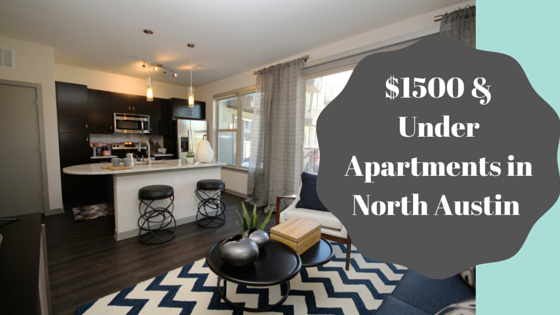 Wondering what kind of apartment $1,500 will get you in North Central Austin? Read on to find out! If you are looking to live just north of UT, then Hyde Park is a great choice for you. 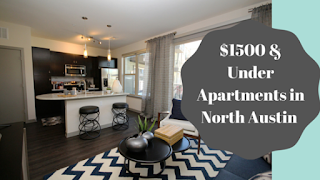 For $1485, you can get a one bedroom, one bath with a sunroom and 714 square feet in an almost new community with stained concrete floors, industrial design, and washers and dryers in all units. Restaurants and retail are on the premises, it is close to the UT shuttle, and management is pet friendly. Another one bedroom one bath option is $1400 for 700 square feet in a community with amazing views of downtown, Nest and Google Fiber, pre-wired alarms, large balconies and large energy-efficient windows. $1372 gets you a 971 square foot two bedroom, two bathroom apartment in a recently remodeled property from the 1980’s in Brentwood. There are hardwoods in some units and the community is within walking distance of Crestview Station and major bus lines. A two bedroom, one bath 920 square foot apartment can be had for $1150 in a courtyard community with spacious floor plans, gas in the kitchen, and porches that is on many major bus routes. In Allandale, you can get a one bedroom, one bath 695 square foot apartment in an almost brand new community for $1450. Apartments feature kitchen islands, dual sinks, quartz counters, and hardwood floors and the community has a fitness center, pool, and sky lounge with amazing views of the city. Another Allandale option is a two bedroom, two bathroom 900 square foot apartment in a more mature community for $1250. Amenities include seven onsite laundry facilities, gas heating and cooking, multiple flooring options, easy access to Mopac, and available covered parking. In Crestview, $1372 gets you a two bedroom, two bathroom, 971 square foot unit in a completely updated community with a dog park and pet washing station and available short term leases. Some apartments have wood-burning fireplaces and all have private balconies or patios with storage, washer/dryer connections, and available wood-style flooring. For $1419, you can get an 894 square foot one bedroom, one bathroom with a loft in a mixed-use community with shopping, dining, and access to the MetroRail and multiple bus lines. The design is ultra-modern with subway tile backsplashes, island kitchens, track lighting, stainless steel and black appliances and stained concrete floors. As you can see, your dollar goes farther in North Central Austin. If you are willing to live in a slightly older community, you can get much more in terms of square footage and number of bedrooms and bathrooms. An expert apartment locator can help you sort through your needs and wants and find the perfect apartment for you. Give Austin Apartment Specialists a call today at 512-318-2504 and let us demystify the apartment hunting experience absolutely free! A new Austin development will be revolutionary because it will be the first to be built downtown without any parking, The Austin American Statesman reports. Already, 12.3 percent of those who rent a downtown apartment decline to rent a parking space. The Avenue will have 30 stories and include 135 luxury one and two bedroom apartments. There will also be 5 floors of office space, a restaurant, a bar, and a music venue in the basement. However, there will not be any space for parking in the development. With all the amenities that downtown has to offer, a car isn’t necessary for inhabitants and Austin City Council has already eliminated parking requirements for projects downtown. The Avenue is located at Congress and 8th Street and is slated to begin construction on May 1, 2017. It is expected to take two years to build and cost between $55 and $60 million. The apartments in the community are set to be micro-units of 420 to 970 square feet. Accordingly, rent will be about 15 percent less than downtown’s average one bedroom rate of $2,200. Amenities will include a pool, rooftop deck, gym, and community room. The developers of the Avenue will provide the Paramount and State theaters, which are located next door, with administrative space, dressing rooms, classrooms and more. Although the carless residential concept is radical in Austin, it has been successful in other cities including Seattle, Portland, New York and Denver. -near your work so you can walk or bike to the office. -on a bus line so when you do need to travel, you can do so easily on public transportation. -in an area with bike lanes and sidewalks so you can get around safely without a vehicle. -near amenities like grocery stores, schools, and restaurants. Ready to start that car free lifestyle? 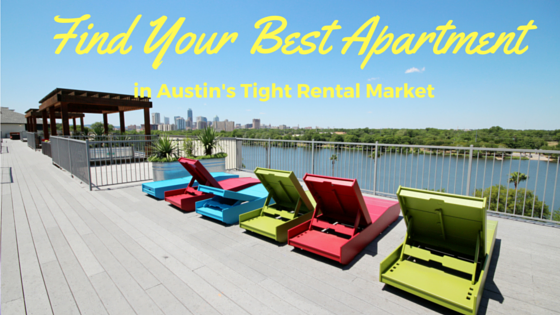 Give Austin Apartment Specialists South Austin a call today at 512-200-7535. Anyone who has lived in Austin for a while knows rental rates and housing prices are constantly on the rise and it’s becoming increasingly more expensive to live in this city. The higher cost of living has an especially harsh effect on musicians, who often find themselves living at or near the poverty line in order to keep doing what they love. Austin mayor Steve Adler has made it one of the goals of his office to examine the plight of Austin musicians and music venues and take steps to improve their experience of the city. He and city council created the Music and Creative Ecosystem Omnibus Resolution, which ordered city staff to come up with solutions and includes 10 recommendations which Adler considers the highest priority, reports KVUE. Protect existing and Increase affordable space for musicians to create and perform. Create an Agent of Change Principle, meaning the onus is on new developments near music venues to adapt to the surroundings by creating soundproofing and marketing the developments as providing great access to Austin’s music culture. Leverage tourism marketing to include a broader range of artistic institutions and benefit musicians. Provide an Entertainment License which will simplify permitting for music venues. Increase Genre Development by developing ongoing relationships with existing and potential audiences through artistic programming, marketing, and more. Use traditional economic development tools like incentives and loans to stabilize and grow the artistic community. Change existing land use regulations to make it easier to develop and preserve creative venues. 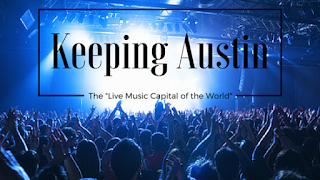 Streamline the permitting and licensing process for music venues. Increase Professional Development opportunities for creative professionals in the form of business seminars and the opportunity to learn from successful creatives in the community. Come up with creative ways to provide revenue for musicians. The Austin American Statesman reports that The Music Commission, a citizen-led commission which serves in an advisory capacity for city council, focused on simplifying the permitting and licensing process for venues, making changes to existing land use regulations and employing the Agent of Change Principle as their top priorities. The city council will review the commission’s recommendations once they return after their July break. 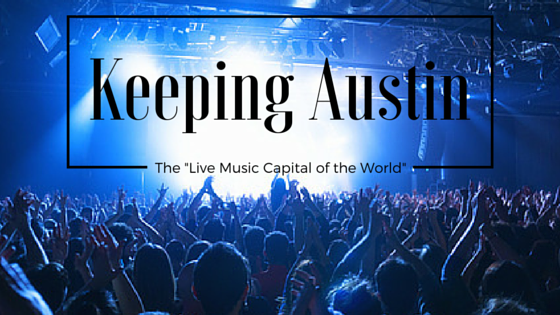 A great way to support live music and make sure Austin keeps its crown is to go out and see some live music! On any given night, you can find fantastic musicians performing all over town. Downtown? 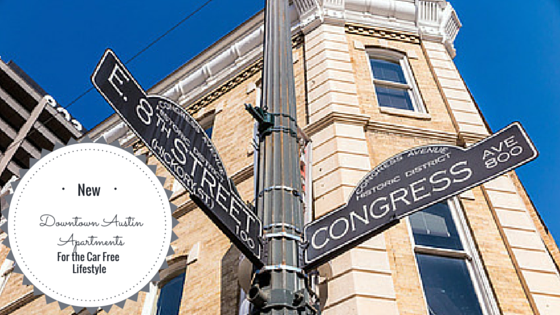 Check out the Red River Cultural District, which is between 12th and 7th streets. There you’ll find a slew of live music venues like the Mohawk, Cheer Up Charlie’s, and Stubb’s. On the south side of town? Saxon Pub and The Broken Spoke have been putting on live music since before you moved here, and Strange Brew Lounge Side is newer, but has one of the best listening rooms in town. Grab a cold one, pull up a chair and immerse yourself in the music. Want to make the music part of your life on a permanent basis? Give one of our seasoned apartment locators a call at 512-912-8000 and let Austin Apartment Specialists South Austin do the hard work of finding a great place to live while you keep on rocking! According to the Austin Business Journal, rents continue to increase in Austin. How can this be? Anyone who has seen the cranes around town knows that new inventory is being built constantly. However, construction can’t keep up with demand and occupancy is still at 94%. The east submarket has seen the biggest increase in rent in the last year, but is still one of the most affordable areas. Rent for a one-bedroom east of Springdale road and north of the Colorado river is $783. Compare that to a downtown one-bedroom with an average rent of $2,080 and you can see that deals are still to be had, as long as you are flexible on location. So what is a renter’s best chance to find a deal? After you've decided where you want to live and what your budget is, team up with an apartment locator, who knows the market, up-to-the-minute vacancies, and deals and incentives apartments are running. Second, expand your search. Maybe there’s nothing in your first choice area, but there might be something in an adjacent area that can be had for cheaper and for a better deal. Third, think hard about what amenities you have to have and those you can live without. Sure, an onsite gym sounds fantastic, but if you run on the trail or have a place to workout at your office, you may never use it and can opt for a complex without that amenity, which results in savings. Free yoga classes and bikes for rent sound super cool, but if you don’t use them, you’re just subsidizing your neighbors. Finally, think about other ways you can save money. Can you make do with a one bedroom apartment instead of a two-bedroom? A studio instead of a one-bedroom? Maybe there’s a floor plan with a nook that will work as an office instead of having to pay for a whole other bedroom that is rarely used. Another option is taking on a roommate to help subsidize the larger two bedroom in a better location. If you live near work and public transportation, maybe it’s time to sell your car. All these things are great ways to save money and help you pay rent. Ready to find out what’s out there? Give Austin Apartment Specialists a call today at 512-200-7535 and get an expert on your side as you navigate Austin’s challenging rental market.